I have a new addiction and it is all GeekDad’s fault. Last week, GeekDad posted about how math teachers are using KenKen as a educational tool. Knowing that NHL loves math almost as much as I do (sometimes I think more than I do), I decided to try it out to see if it would be good for him. I found an Android app called MathDuko. MathDuko follows the same rules as KenKen so I figured it would be a good app to try. Big mistake. Now I’m hooked. In many ways, KenKen and MathDuko follow the same rules as Sudoku. In both, you must use the given numbers only once in each row and column. However, whereas Sudoku has groups of 9 blocks (3×3) that must contain one of each number, MathDuko has a veritable jigsaw puzzle setup. Each piece of the MathDuko puzzle has the result of a math equation and how it was obtained. For example, in the image above, a three square piece says "12x". This means that the three numbers, when multiplied together, total 12. You are limited in numbers from one to the width/height of the board. In this case, this means that the available numbers are one to seven. In the example above, this means that the numbers in the "12x" piece could be 1, 3, 4 or 2, 3, 2. (The puzzle spans multiple rows and columns. MathDuko doesn’t have Sudoku’s one-number-per-block limit. In addition, the numbers can be in any order. In the "2-" puzzle block, the answer could be 5, 3 just as easily as it could be 3, 5. So how does the app fare? Amazingly well. 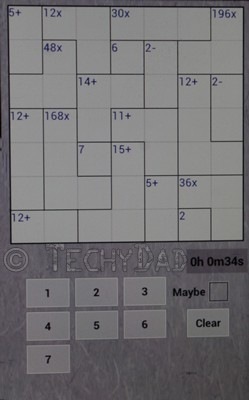 You can select puzzles from easy (4 squares by 4 squares) all the way up to "ultimate" (9 by 9). A clock keeps track of how long your puzzle solving is taking. (This is a feature that can be turned off for those who don’t wish to race the clock.) You can also mark potential values as "maybe" to keep track of the many possibilities. Of course, the price is also right: The app is free. I’d definitely recommend the app to anyone with a love of math be they in elementary school or long since graduated from college. I see much time spent figuring out MathDuko boards in my future.